I’m pretty sure that each and every one of us have our own ideas about how something should be. We imagine in our mind’s eye the qualities that should make up a thing, and we decide whether or not those qualities are present based on some (often hidden) standards that we have. Or sometimes, we have actual knowledge of how something should be based upon real experience and previous observation, and surely that counts for something. It seems like it’s often a balancing act trying to figure out when to leave well enough alone, as the saying goes, or to continue to tweak. 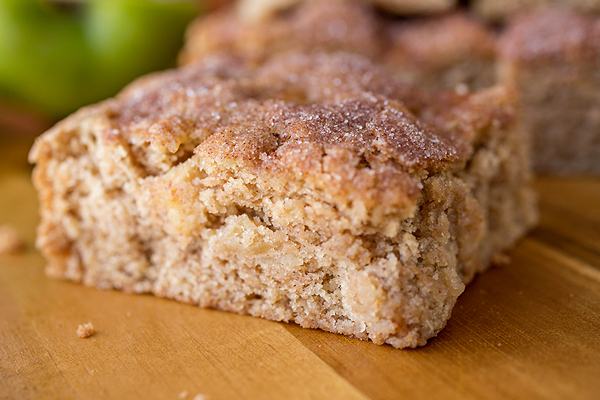 But it’s always a delicious treat when a simple, delectable, seasonal apple and brown sugar snickerdoodle cake sheds a little light on the subject and makes one realize that there can be scrumptious perfection in something simply just being different from one’s original ideal. 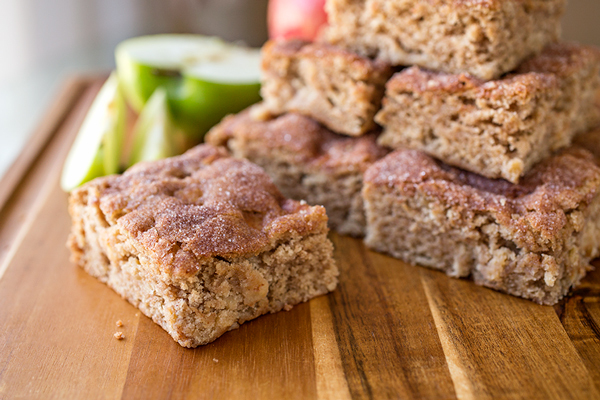 A few weeks back, I had a thought for a really tasty recipe for apple snickerdoodle bars, the kind that would be based on the cookie, and would be dense, thick and slightly chewy. So I went to work putting together the recipe ingredients that I thought would be perfect to create those desired bars, with those particular (and mouthwatering) characteristics. 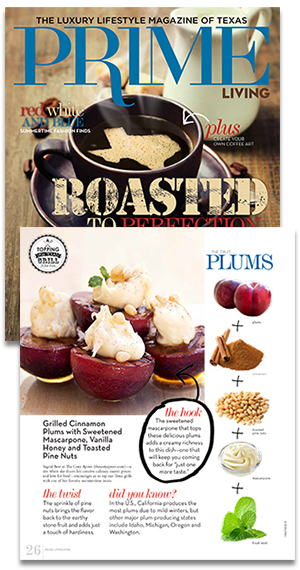 When all was said and done—all creamed, blended and baked—I ended up with a different result than I had hoped that I would; but in complete truth, I found it to be utterly irresistible as I took bite after sweet-spicy, apple-y bite. Had I found a “perfect” version of the recipe that I hadn’t expected, even though these bars were not dense or chewy, which was my initial aim? I discovered that I had made more of a cake, instead; a cinnamon-sugar-y, moist, rich, melt-in-your-mouth, light and buttery cake, almost doughnut-like. And this result was too delicious not to share in exactly the form it was presently in. I still felt a tug as to whether or not I should keep tweaking with the recipe—could I leave it just as it was, even though it wasn’t what I had originally imagined? Would I be able to let it be and just appreciate it’s own perfection? 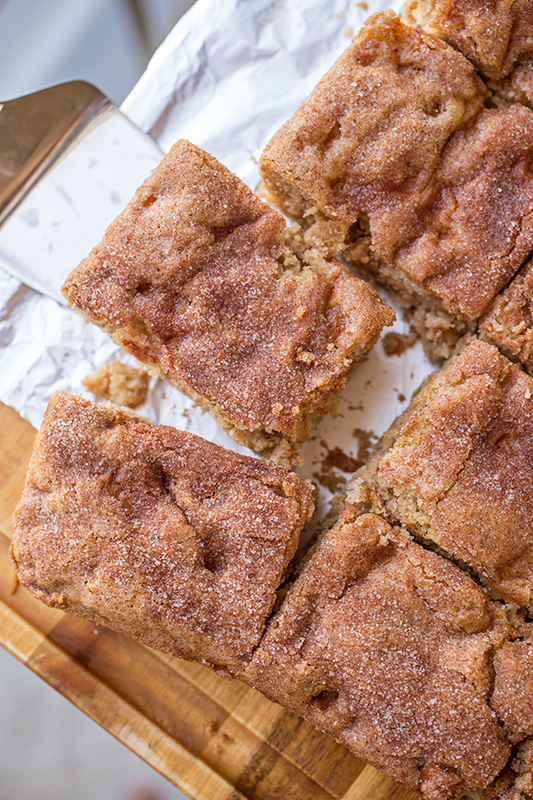 Because I realized that though it was great to have my plan for a dense snickerdoodle “bar”, these squares were perfectly delicious and equally pleasurable just as they were, even though they were different from what I had imagined. And for that simple reason, they were worth sharing. This makes me think about how so many times we’re willing to get down on ourselves for not being who we “should” be, or for not being in life where we “ought” to be; that we don’t see ourselves full of some delicious qualities, some unique and wonderful qualities, because of the preconceived ideals that we often carry for ourselves. And sometimes, we place that burden upon others in our lives, as well. Perhaps it would be wise and healthy for us to assess and highlight what is good within, what contributes to the wellbeing of others, and be willing to share that fully; and to see that in other people, and to help them to have the courage to share it, too. 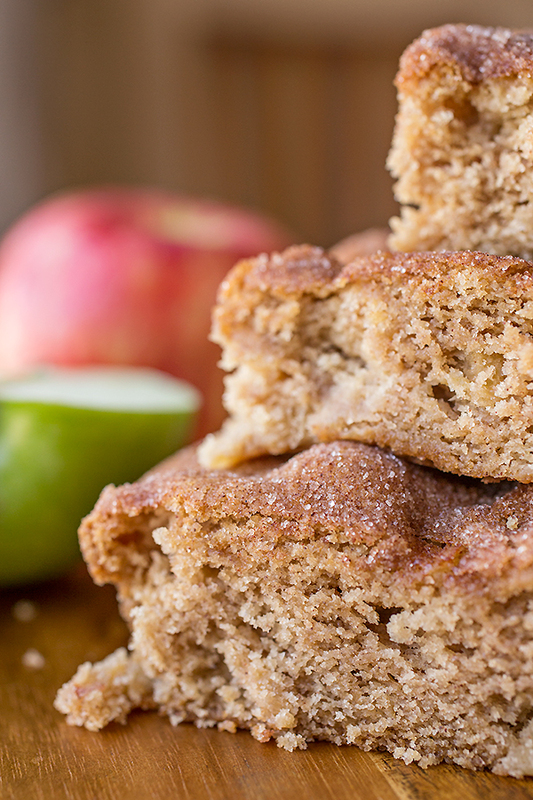 Sometimes, things turn out differently in our lives than we imagined that they would; but what if we took more time to look for that perfectly-delicious-as-it-is apple snickerdoodle cake within, and then offer up a slice or two to the world just because it’s too darn tasty not to? Knowing when something is perfect just as it is, is something that we learn over time, I suppose. We become less hard on ourselves and on others, and learn to taste and sample with more discernment and understanding that which makes something delectable and worth sharing, even if it turned out differently than we imagined. 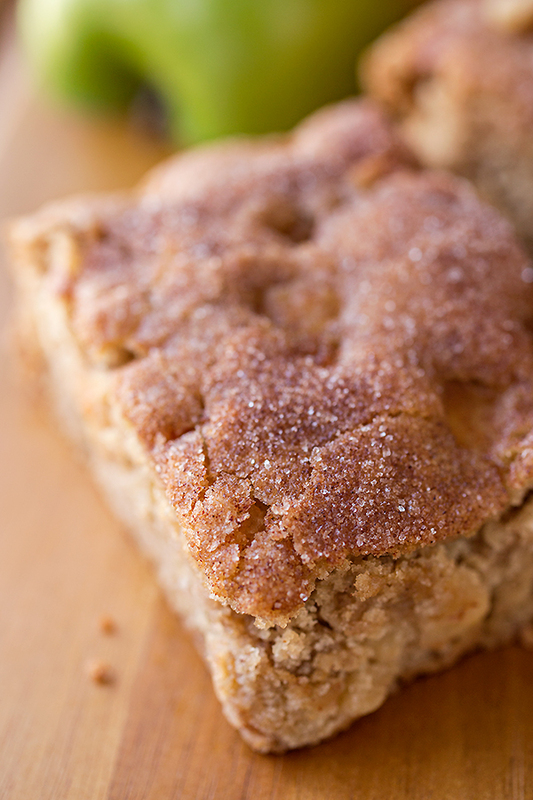 And that being said…Apple and Brown Sugar Snickerdoodle Cake, anyone? -Place a large, non-stick pan over medium-high heat, and add in the 1 tablespoon of butter; once melted, add in the diced apples, and cook them for about 6-8 minutes just until softened but not mushy (you can even add a pinch of cinnamon to them for added flavor, if you’d like). -Transfer the cooked apples onto a paper towel-lined bowl or plate, and allow them to completely cool in the fridge, or even freezer (to expedite) while you prepare your cake batter. -Line a 9 x 13” pan with a piece of foil that overhangs, and lightly mist everything with cooking spray. -Add your flour, cream of tartar, baking soda, ground cinnamon and salt to a bowl, and whisk to combine; put these dry ingredients aside for a moment. -To prepare your batter, add the 1 cup of butter to a stand mixer fitted with a paddle attachment, along with the brown and granulated sugars; mix together on medium for about 2 minutes, until fluffy and light. -Add in the eggs, one at a time; once those are incorporated, add in the vanilla, and mix. -Scrape down the sides if necessary, and slowly, in increments, add in your dry ingredients until combined but not over-mixed; next, add in the cooled, diced apples, and allow those to incorporate/mix in. -Spoon the batter into the prepared pan, and using a small offset spatula, spread the batter so that it is as even as possible in the pan; place the batter into the freezer to chill for 15 minutes. -Preheat your oven to 350° at this point. -Once the batter is chilled, sprinkle with the cinnamon-sugar topping, and bake for 30 minutes, or until a toothpick inserted into center comes out clean. -Allow to completely cool before cutting into squares. 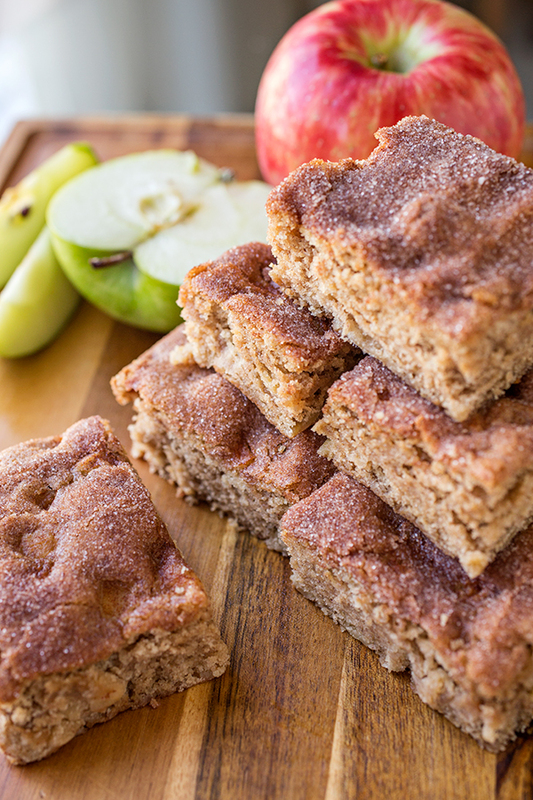 -Using a fork, combine sugar with cinnamon, and top. So excited to read! Glad you enjoyed, and thank you for stopping by to comment. 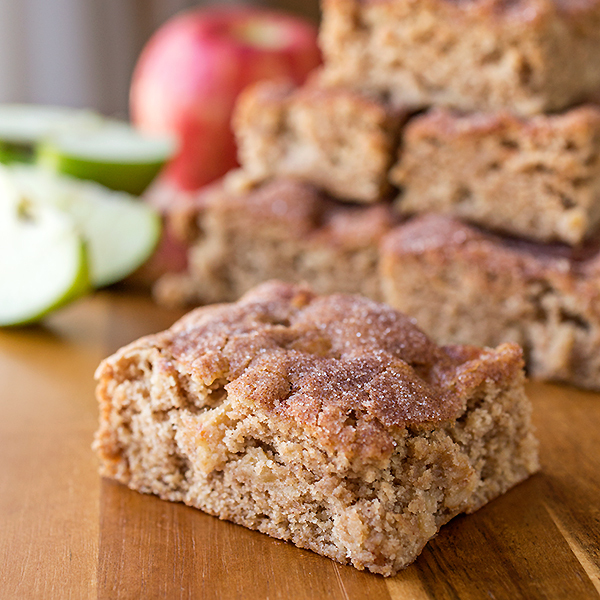 Absolutely love this recipe and just shared it on my blog in a round up where I share my favorite fall apple desserts! Looks so yummy. Thank you. Hope you give this a try, Liz! Made these this weekend. Even converted them to gluten free. They came out great! Definitely a new fall favorite treat. Sarah, that’s great that you were able to make these gluten-free to fit your needs! 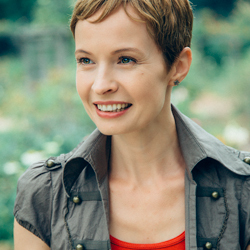 Thanks for sharing your experience, and I’m so happy you enjoyed ’em! Not sure what happened, but we tested on our end and the print function is working now. 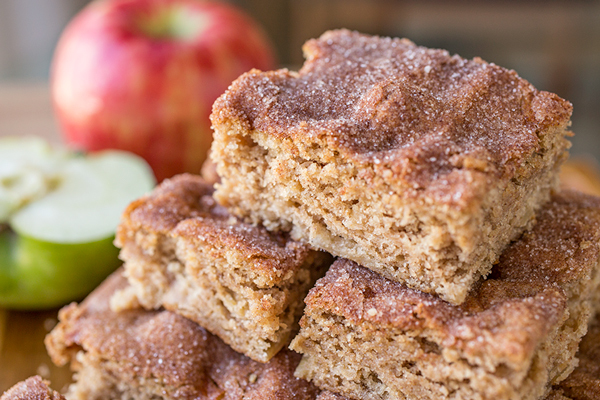 Could this be made with only honey crisp apples?